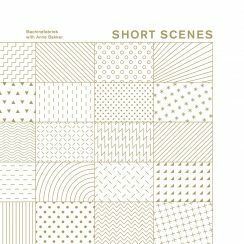 Short Scenes / With Voices – two examples of the versatility of Rutger ‘Machinefabriek’ Zuydervelt: working on improvised tracks recorded by violinist Anne Bakker as well as experimenting with various vocalists. Read post"Machinefabriek – Short Scenes / With Voices"
Read post"Trondheim Voices + Asle Karlstad – Rooms & Rituals"
Read post"Alio Die & Lorenzo Montana – Holographic Codex"
“A collection that holds twelve works for voice and 1/4″ tape” is a description that immediately grasps my attention, especially when the performing artists is “a trained opera singer, delivering an elegant balance between theatrical and ambient sentiments”. Read post"Ian William Craig – A Turn of Breath"
Richard Chartier – composer, sound artist, designer, LINE label curator – has released over 30 critically acclaimed albums under his own name since 1998, building himself an unrivaled status in the ‘reductionist’ electronic sound art field. “Pinkcourtesyphone is a more emotional, dare one say musical side of his work. Pinkcourtesyphone is dark but not arch, with a slight hint of humor. Pinkcourtesyphone is amorphous, changing, and slipping in and out of consciousness. 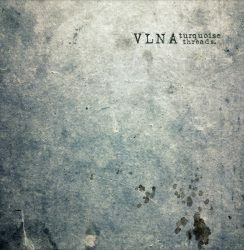 Read post"Pinkcourtesyphone – Description of Problem"
Before you start listening, answer this: what associations do you have with a band name like VLNA? Personally, I prepared for somewhat ‘unpersonal’ and possibly even ‘harsh’ sounds when I started listening. 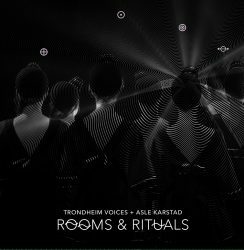 But I was in for a surprise:“Turquoise Threads“ is an ‘impressionist vocal’ album – an album with spoken words fragments, humming, whistling, intertwining with ‘a thick veil of atmospheric noir from threads of adapted violins, guitar’ (and electronic treatments). Read post"VLNA – Turquoise Threads"
Apart from being an ‘ambient-electronic’ music addict, reggae music- and especially dub music – has been playing a major role in my musical life. There is a distinct crossover area between experimental electronic music and experimental dub reggae, as demonstrated by genius artists like Lee Perry and Bill Laswell (among others, of course). Dub Music, rooted in reggae, is often very experimental music. 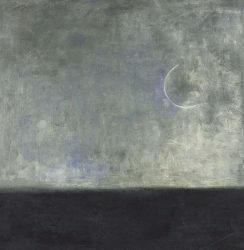 I have heard a lot of ‘ambient’ music cross over to different styles, up to the simple fact that there is no clear definition of what ‘ambient’ music is any more. 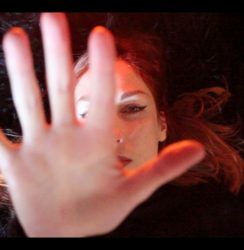 But to my own surprise I wasn’t really prepared for Marina Rosenfeld‘s approach on her recent ROOM40 release “P.A. / Hard Love“. Read post"Marina Rosenfeld – P.A. – Hard Love"
Shortly after the release of “The Eskdalemuir Harmonium”, Chris Dooks releases the second part of what will become a colourful Idioholism trilogy. 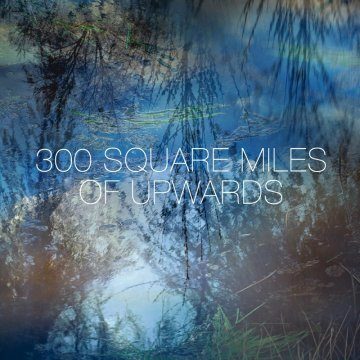 “300 Square Miles of Upwards” is released in a stunning package (designed by Rutger ‘Machinefabriek’ Zuydervelt): a bright blue vinyl 12″ album that also comes with an (extended) digital download version including a video version of the opener track ‘Gardening As Astonomy’. Read post"Chris Dooks – 300 Square Miles of Upwards"
Following up Leonardo Rosado’s “Mute Words“, this is the second release on the Heart and Soul label, which was founded to release projects that combine music and poetry. The Dwindlers are a duo consisting of Michelle Seaman, poet, and Benjamin Dauer, composer and multi-instrumentalist. Although they have been working together since 2002, “Allegories” is their second album, following up their 2010 debut release “Dreams”. 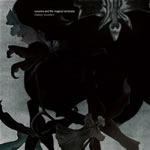 Read post"The Dwindlers – Allegories"
“Deislieper” is the third release in what I like to call the “Kleefstra Wire Trilogy“. 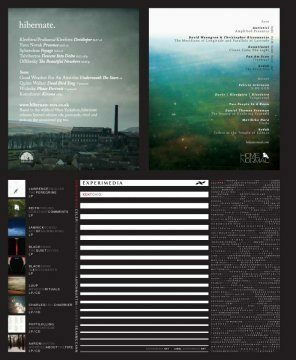 In fact, there’s no real ‘trilogy’, but three separate albums that were presented by three independent labels on one single advertising page in Wire Magazine: “Wurdskrieme” (on Experimedia). “Tongerswel” (on Home Normal), and now “Deislieper” (on Hibernate). Rooted firmly in the improv scene, core members Jan (poetry) and Romke (guitar, effects) Kleefstra never work alone. With Piiiptsjilling, most of the contributors were Dutch fellow musicians (like Rutger ‘Machinefabriek’ Zuydervelt, Mariska Baars, Chris Bakker), but soon they also started playing with an international cast of musicians like Peter Broderick, Nils Frahm, Greg Haines (on the Seeljocht project). Tongerswel presented their work together with saxophonist Gareth Davis, and now Deisleeper features the incredible percussion music by Sytze Pruiksma. Paul Sharma‘s Embers is a beautiful electronic composition based on the Indian midnight raga Malkauns, and thus is very suitable for midnight listening (The Raga Guide indicates Late Night: 12 – 3). On this version the vocals are more in the middle octave as that suits Rajesh’s voice, but there are instruments at the lower (and sub-lower) to compensate. The vocal piece starts with an alap (free or rhythmless tempo) and then a slow tempo vocal. Read post"Paul Sharma – Embers"
It’s not ambient, and it’s only remotely electronic. Still, when I discovered this album last week (it was released in march this year), it left me completely speechless and utterly fascinated. The Happiness Project is a concept created by Charles Spearin from Toronto, known by some for his contributions to Do Make Say Think and Broken Social Scene. For this project he has been interviewing some of his neighbours in downtown Toronto, and used their recorded voice to create the musical track. In these sample-laden times that in itself does not sound very spectacular, but Spearin focussed on the melody of the voice and doubled it with a musical instrument fitting the voice. The pitch of the voice is never changed, but rhythmic and melodic patterns are created by repeating some of the phrases. Thus resulting in a sparkling and engaging kind of experimental jazz music. Read post"Charles Spearin – The Happiness Project"
It’s hard to tell what it is exactly that touches me everytime I hear the songs of The Innocence Mission. Is it the pureness (innocence?) of singer-songwriter Karen’s voice, reminding me of early 10.000 Maniacs? 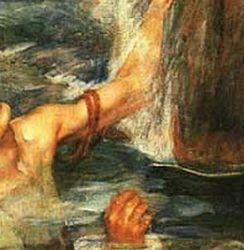 (This connection is no coincidence: Karen and Don Peris contributed to Natalie Merchant’s Ophelia). Is it the open, seemingly simple, acoustic arrangements played by Don Peris on guitar and Mike Bitts on bass? Is it the combination? Does it matter, anyway? Read post"The Innocence Mission – We Walked in Song"
Tor Lundvall’s name has been a bit of a buzz in the ambient community recently. Contrary to what you may expect, he’s not living in Scandinavia but in New York. 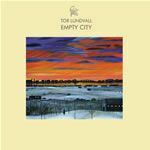 And he’s not only a musician but also a painter, as can be seen on his website http://www.torlundvall.com/. Read post"Tor Lundvall – Empty City"
To say that I was touched by “Melody Mountain”, by Susanna and the Magical Orchestra would be an understatement. In fact, it hit me quite hard. 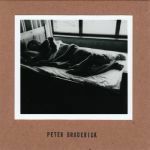 It may seem a bit strange to have an entry on this blog about a vocal cd containing pop covers…if it weren’t for the music in the background. 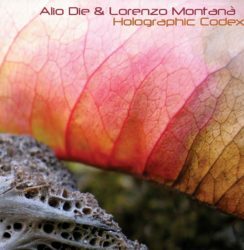 This sparse, mainly electronic music will certainly appeal to the ambient music fan. It is created by jaga Jazzist keyboard player Morten Qvenild and produced by Deathprod (Supersilent) – who is well known for his own ambient music and his collaboration with Biosphere. Backed by this (almost ambient) soundtrack, Susanna’s voice sounds even more intimate and honest. The selection of artists covered may well raise an eyebrow (or two): Prince, Leonard Cohen, Bob Dylan, AC/DC (!! ), Kiss (!!!! ), Depeche Mode, Fairport Convention (the cover of Fotheringay is especially moving) , and the inevitable Joy Division (sampled here). If you like Nouvelle Vague but think they were a bit too light-hearted, be sure to try out Melody Mountain! Read post"Susanna and the Magical Orchestra – Melody Mountain"